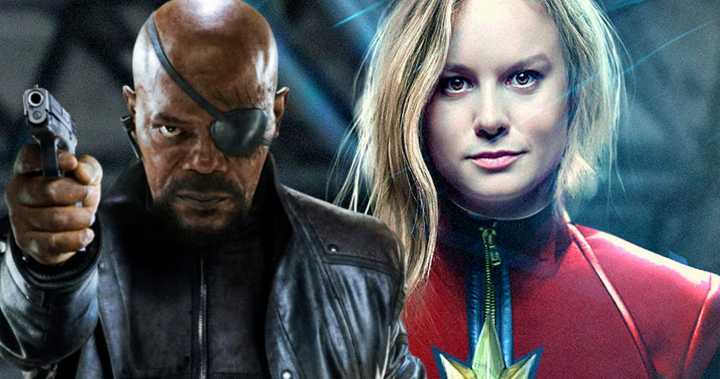 Why ‘CAPTAIN MARVEL’ Movie Ends With Nick Fury and Not Carol Danvers? With Captain Marvel now officially released in the theaters, the reviews are in for the final MCU movie before Avengers: Endgame arrives in April. Already, it’s proven to be a massive hit at the box office, introducing the world to Carol Danvers and her rather impressive superpowers.Captain Marvel introduces Carol Danvers to the Marvel Cinematic Universe. But Many people are still confused about Captain Marvel’s Ending, so here we are with full explanation to Captain Marvel’s Ending. Carol returns to Earth after years of service in space as a member of the Kree Empire’s Starforce. But the film doesn’t end with Captain Marvel rebuilding her life on Earth. Instead, she heads back into space to try to end the Kree-Skrull war and find a new homeworld for the Skrull people. The movie ends with a shot of Nick Fury, the SHIELD agent that helped Carol when she got to Earth. He’s putting together the proposal for the Protector Initiative. Upon finding Carol’s Air Force call sign, he renames the project the Avengers initiative in her honor. What did the Director say about the film’s ending? Fury’s Avengers Initiative would lead to the Avengers assembling for the first time to stop Loki and the Chitauri invasion in The Avengers. Carol will join the team that was named for her in Avengers: Endgame as they attempt to undo what Thanos accomplished in Avengers: Infinity War. What happens to Carol at the end of the film? She decides to depart Earth to take Talos and the other Skrulls across the galaxy to a new homeworld. Carol does gift Fury with a modified pager, however, to be used in an emergency and can contact her across multiple galaxies. After an emotional goodbye to the Rambeaus, Carol blasts off into space with the Skrulls. In the end: Goose puked the Tesseract on Nick Fury’s desk! When Starforce arrives at Earth to track down their rogue soldier, Captain Marvel, they seek out the cube for themselves so they can use it to destroy the Skrulls. It’s on board Wendy Lawson’s laboratory that has been camouflaged in space just above Earth. In the battle for the cube inside the lab ship, the cube ends up in the stomach of Goose the cat – or rather, Goose the Flerken. Just before the Kree get their hands on the Tesseract, suddenly Goose’s mouth opens up into a much bigger jaw with tentacles shooting out of it. The tentacles grab the Tesseract, and it stays inside Goose for the remainder of the movie, until the post-credits scene. At the end of Captain Marvel, Goose has decided to stick with Nick Fury at S.H.I.E.L.D. and is just lounging around in Fury’s office. And like every cat out there, she has no problem puking on Nick Fury’s desk. Except this isn’t a hairball that Goose throws up. It’s the Tesseract, all slimed up from Goose’s insides. Also Read: Is Captain America Going To Die In ‘Avengers: Endgame’? That explains how S.H.I.E.L.D. kept the Tesseract in their possession, but it doesn’t explain exactly how Lawson/Mar-Vell ended up with it. Captain Marvel stars Brie Larson, Samuel L. Jackson, Ben Mendelsohn, Djimon Hounsou, Lee Pace, Lashana Lynch, Gemma Chan, Rune Temte, Algenis Perez Soto, Mckenna Grace, with Annette Bening, with Clark Gregg, and Jude Law. The film is directed by Anna Boden and Ryan Fleck, from a screenplay written by Boden & Fleck and Geneva Robertson-Dworet and Jac Schaeffer, based on a story by Nicole Perlman and Joe Shrapnel & Anna Waterhouse. Kevin Feige produces, with Louis D’Esposito, Victoria Alonso, Jonathan Schwartz, Patricia Whitcher and Stan Lee serving as executive producers.